Apparently Delta Air Lines has placed public-use iPads at their airport terminal at JFK (no not the command line Terminal.app, an airport terminal). This is a great idea for many reasons, maybe it’s a sign of things to come at airports everywhere? iPads are getting a wide range of uses already become restaurant menus in China and flight manuals, what’s next? Picture found via Sachin HD, who by the way, is one of the original engineers on the Final Cut Pro project at Apple. He’s got some pretty interesting thoughts on Final Cut Pro X, it’s worth reading if you’re following the news and response associated with that application. 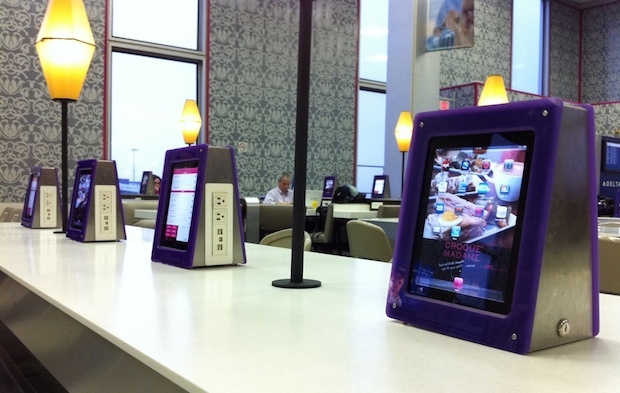 Those ipads are inside a restaurant in Delta Terminal. nice enclosure for the ipad ..